NOTE: This is an article for advanced readers. If you are new to display motion blur reduction modes (e.g. ULMB, LightBoost, DyAc) see Motion Blur Reduction FAQ instead. This article is for those who are familiar with strobe crosstalk (double-image effect) during Blur Reduction modes, and dislike that effect, and/or want to understand it better. If you are new to gaming monitors, see List of Best Gaming Monitors. There will be unavoidable minor strobe crosstalk with most Blur Reduction technologies (including ULMB and LightBoost). It may be worse at the top/bottom edge of the screen. This is normal. Most of the time, average strobe crosstalk is not noticeable in normal gameplay. Faster LCDs generally have less strobe crosstalk. 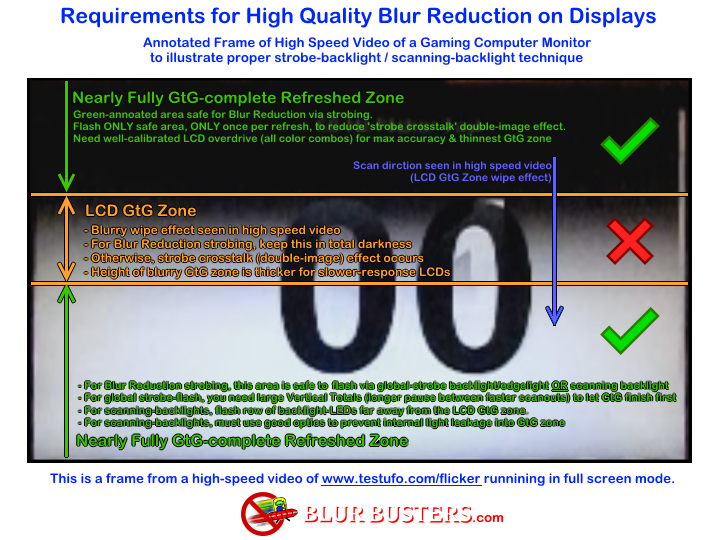 For high-quality blur reduction, LCD GtG needs to be significantly faster than the time period of a single refresh cycle. Properly-tuned LCD overdrive also helps, preferably overdrive optimized for strobe backlight operation. Other monitor engineering techniques such as multi-pass refresh cycles also helps. Timing/phase of strobe backlight flashes relative to refresh cycles. Some monitors have this adjustable, via “Area” on Zowie monitors (XL2540, XL2546), or via “Strobe Phase” in Strobe Utility (XL2411, XL2420, XL2720). Strobe duty cycle (flash length) also plays a role. The speed of the scan-out to the LCD panel also influences strobe crosstalk. A faster-scanout can result in a longer pause between refresh cycles. More idle time between active scan-outs reduce strobe crosstalk by giving more time for LCD GtG pixel transitions to complete unseen in the dark period between refresh cycles (hiding LCD response limitations better). Some panels internally use a faster scan-out to panel than scan-out on the video cable (from the GPU). It is however, possible, to do this externally via Large Vertical Totals (in instant mode). The remainder of this article explains how this happens. If it looks unacceptable, try a lower refresh rate if you enable a blur reduction mode. There will usually be bad strobe crosstalk at 144Hz on 144Hz monitors. For such situations, use a lower refresh rate, such as 120Hz or even 100Hz, to avoid most strobe crosstalk. ULMB is also usually supported at 85Hz and 100Hz. Also, if the panel is freezing cold (winter in an unheated room), the LCD will respond slower. This is especially true for VA panels which is more sensitive to temperature-induced strobe crosstalk than TN / AHVA / IPS panels. Warm up the monitor first to reduce strobe crosstalk. 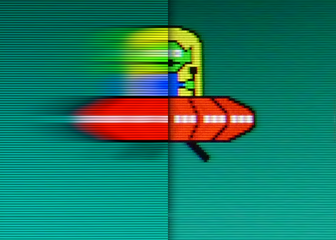 Framerates lower than refresh rate can also produce a similar double-image artifact. While this is not strobe crosstalk, it can look similar or identical. 30fps on 60Hz CRT and plasmas can also produce a double-image effect that looks similar to strobe crosstalk. The same effect can happen when running a framerate of 60fps on 120Hz LightBoost. To isolate the cause of strobe crosstalk, run at full frame rate. Use TestUFO Motion Tests running at full frame rate. If your game cannot keep up at full frame rate, and you still want to use blur reduction, try testing a lower refresh rate (e.g. ULMB 85fps at 85Hz) to reduce or eliminate the double-image effects when strobing on low frame rates. For best quality during Blur Reduction, run full frame rates matching the refresh rate. Keep mouse micro-stutters under control with a good gaming mouse, since blur reduction will amplify the visibility of stutters. Any remainder double-image effects will then be caused by the monitor rather than by low frame rates. To test for strobe crosstalk properly, you must have full frame rate matching refresh rate. You need one strobe flash per frame in order to properly isolate strobe crosstalk. Use a display with easy high-quality strobing such as NVIDIA ULMB (Ultra Low Motion Blur). Use a display that has advanced strobe adjustment abilities (strobe phase adjustment, etc) such as BenQ/Zowie gaming monitors. See Official List of Best Gaming Monitors for all gaming monitors that contains Blur Reduction. Researching carefully will help you avoid models of monitors have unremovable bad strobe crosstalk where their double-image effect is not adjustable. Not applicable to NVIDIA LightBoost / ULMB. They are pre-adjusted at factory. For some monitors (including many BenQ/Zowie models), there are advanced adjustments that can improve the quality of Blur Reduction. 1. Advanced Strobe Phase Adjustments: Some monitors permits manual calibration of motion blur reduction via multiple settings such as “Strobe Timing” / “Strobe Phase” / “Pulse Timing” / “Area”, sometimes via a Service Menu. 2. Advanced “Large Vertical Total” Tweak: Large Vertical Totals can be achieved via a Custom Resolution Utility. Several monitors also can reduce strobe crosstalk via Large Vertical Totals. For panels that have a realtime lagless scanout mode (Instant Mode), using Large Vertical Totals speed up a refresh cycle (faster dotclock, accelerated scanout) to allow a longer pause between refresh cycles. Large Vertical Totals gives more time for a strobe backlight to keep LCD GtG pixel response limitations hidden in darkness between faster-scanned-out refresh cycles. The most popular monitors supporting this FAQ are monitors with manual strobe-phase adjustment support, specifically BenQ/Zowie gaming monitors (including BenQ Blur Reduction / Zowie DyAc / Dynamic Acceleration). Large Vertical Totals are achieved via Custom Resolution Utilities (CRU) by increasing the size of “Total” under the “Vertical” column — to a number far above the default value. Larger Vertical totals use a higher dotclock at the same refresh rate. During real-time LCD modes (instant mode / lag less mode), large Vertical Totals automatically speeds up scan-out to the LCD panel. It speeds up each individual refresh cycle without raising the refresh rate. In brief, this creates more time between refresh cycles to let LCD limitations (GtG pixel response) to finish hidden unseen in the dark periods between strobe backlight flashes (of Blur Reduction mode). Several tests have shown that several users believe ~180Hz is an excellent compromise for Blur Reducation (or DyAc) on the new BenQ/Zowie 240Hz monitors. The higher the refresh rate, the more unavoidable strobe crosstalk is. This refresh rate is a compromise of a high refresh rate with less visible double-image effect (than at 240Hz). It is also much easier to tweak (usually older) games to run at 180fps than at 240fps. Note: To enter the Service Menu of XL2540, hold button #4 for 5 seconds, then press power On (while holding button #4). Release button #4 after the display appears. 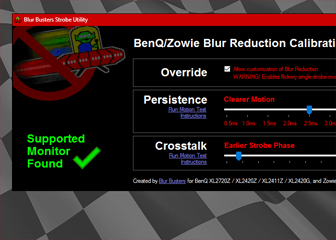 STEP1: On BenQ/Zowie XL2540, the Blur Reduction mode can be enabled via the Service Menu. Once enabled, these values enable a high-quality 182Hz strobed mode with a reduced double-image strobe-crosstalk effect. This can be useful for games that can run at a full framerate 182fps @ 182Hz. Screen from ToastyX CRU. Also possible via NVIDIA. STEP2: Once you set this up, adjust the XL2540’s Service Menu’s “Area” setting. Do this while viewing a motion test TestUFO Strobe Crosstalk in full screen mode (with Blur Reduction/DyAc enabled) to move the double-image “band” offscreen. Test different overdrive settings, but AMA High will usually look the best. Some of these models support the Blur Busters Strobe Utility. Other models (XL2735) require the Service Menu for adjusting strobe phase. Unsuppored: XL2730 doesn’t support real time (instant mode) on big vertical totals. Screen from NVIDIA Create Custom Resolution. Also possible via ToastyX CRU. STEP2: Once this is created, adjust “Strobe Phase” via Strobe Utility, or adjust “Strobe Phase”/”Area” via Service Menu of monitor. Adjust this setting while viewing a motion test TestUFO Strobe Crosstalk (with Blur Reduction/DyAc enabled) in full screen mode to move the double-image “band” offscreen. Test different overdrive settings, but AMA High will usually look the best. NOTE: Different Vertical Totals are available for different refresh rates, usually bigger Vertical Totals at lower refresh rate. This can require manual experimentation. Different vertical totals will be needed for different refresh rates, and/or for different monitor models. This will requires lots of manual experimentation. 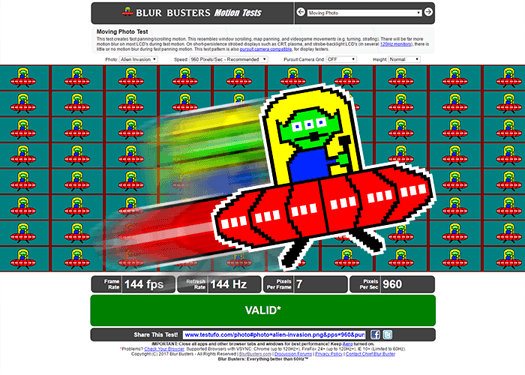 It is also possible that Blur Busters Forums members have discovered ideal Vertical Total for specific refresh rates and/or specific models of monitors. 1. Why do large Vertical Totals reduce strobe crosstalk? Monitor manufacturer may use their algorithms to avoid strobe crosstalk (e.g. ULMB). However, for some monitors (most commonly BenQ/Zowie), there is an end-user method of forcing an accelerated LCD scan out in order to reduce strobe crosstalk. These are “Large Vertical Totals” — the use of a larger blanking interval between refresh cycles. Why do Large Vertical Totals improve the quality of Blur Reduction? Why do Large Vertical Totals reduce the double-image effect (strobe crosstalk) during Blur Reduction? As seen earlier, Large Vertical Totals are achieved by loading a Custom Resolution Utility (usually ToastyX CRU) to increase the size of the vertical blanking interval (Vertical Total equals the size of vertical resolution plus the size of vertical blanking interval). It can improve the quality of Motion Blur Reduction on certain monitors — most particularly strobe backlights of BENQ Blur Reduction or BENQ DyAc, and a few others. 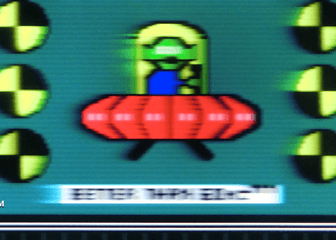 Motion Blur Reduction is accomplished via the use of an optional strobe backlight mode to produce CRT-clarity motion on gaming monitors (e.g. ULMB, LightBoost, BENQ DyAc, etc). The short answer is large Vertical Totals speeds up painting of refresh cycles onto the LCD (faster scanout per refresh cycle), creating a longer pause between refresh cycles. This makes it easier for strobe backlights to cleanly flash a fully-refreshed LCD panel. But exactly how does this work? The rest of this article explains why. During viewing of a full-screen horizontal panning motion (such as TestUFO Strobe Crosstalk), often strobe crosstalk is worse in certain horizontal bands across the screen. Ideally, it should be clearest in the center of the screen, and worse at the top/bottom edges. However, some monitors can have strobe crosstalk near the middle of the screen. Changing the timing of strobe phase (the timing of strobe backlight flash relative to refresh cycle) can change the position of the double-image zone. The common method of “strobe-phase” adjustment (“Area” setting on new BENQ monitors) by end users — one views a full-screen pattern such as TestUFO Strobe Crosstalk while adjusting. The strobe-crosstalk double-image zone moves upwards and downwards — strobe crosstalk affects a different part of the image. The most common situation is to adjust until the screen looks clearest (especially screen center). Some monitors permit this adjustments, such as most new high-refresh-rate BENQ/Zowie gaming monitors. They now provide a 100% fully user-adjustable strobe phase setting (called “Area”, usually via Service Menu) on all their new strobe-capable gaming monitors. Earlier monitors (e.g. XL2720Z) are adjustable via Blur Busters Strobe Utility. Also, it is important to note certain (unnamed) monitor manufacturers are unfortunately much worse; with non-adjustable strobe crosstalk in the center of the screen at all refresh rates. Tip: Double Image effects can also be caused by framerates lower than stroberate — aka double-strobing a frame, either via monitor limitation or via running framerates lower than refresh rate. This is not strobe crosstalk. Other monitor manufacturers double-strobes at certain (usually lower) refresh rates forcing a double-image effect above-and-beyond strobe crosstalk. Strobe crosstalk is different: A double image effect being caused by only one flash per frame — strobe-crosstalk creates double images because of strobe backlight flashes occuring during incomplete LCD GtG transitions. To understand how Large Vertical Totals can reduce strobe crosstalk, it’s time to watch a short high-speed-video. – Refreshes on an LCD panel are painted onto the panel top-to-bottom. – Most strobe backlights attempt to flash between refresh cycles — after letting LCDs finish transitioning (that pixel response, LCD GtG!) in total darkness. This high speed video shows regular LCD operation, and strobe backlight (LightBoost) operation. This is a high speed video of www.testufo.com/flicker running in full screen mode. That pattern is chosen because it is much easier to see the LCD refreshing mechanism via high speed video. That ‘fuzzy zone’ that wipes from the top to bottom, is the LCD GtG zone — at approximately 1ms pixel response, the blurry LCD GtG zone is about 1/8th the height of a 120Hz (8.3ms) refresh cycle. I recently created this graphic for a different thread and the Electronics Hacking: Creating a Strobe Backlight article. 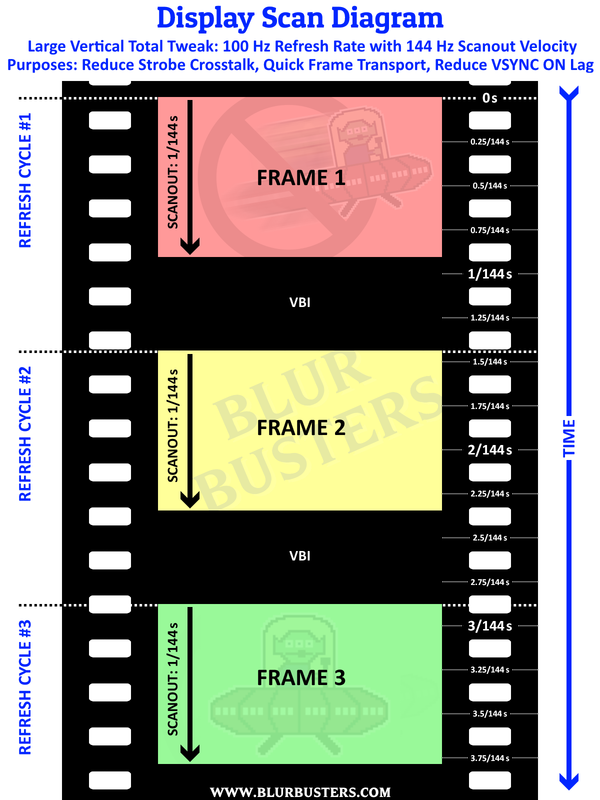 If the monitor flashes the strobe backlight while the LCD GtG zone is in the middle of the screen, you get strong strobe crosstalk like the above “Double-Image Effect” diagram above. Ideally, you want to wait for the LCD GtG zone to go below the bottom edge of the screen before flashing the strobe backlight. However, on many monitors, the time delay between end-of-scanout (previous refresh cycle) and begin-of-scanout (next refresh cycle) is much less than LCD GtG. This means that the LCD GtG zone can wraparound to the top edge of the screen — the blurry GtG zone can overlap the bottom edge and top edge of the screen! Naturally, the faster the scanout (e.g. higher refresh rate), the thicker the LCD GtG zone is, because of the pixel response speed (milliseconds) relative to the time of a refresh cycle (milliseconds). As a rule of thumb, 1ms GtG on a 8ms scanout (120Hz monitor), creates an LCD GtG Zone of roughly 1/8th screen height. Note: Mathematically, GtG is not a perfect complete 1ms — as GtG is measured from 10% transition to 90% transition. So there can be still be extremely faint after-images (faint strobe crosstalk) leaking well into multiple refresh cycles on some monitors. However, manufacturers calibrate overdrive extremely well (or use multi-pass refresh techniques) on some panels to execute GtG extremely accurately, with virtually no human-perceptible after-images in subsequent refresh cycles in most real-world applications. This is technically very difficult to do, but has been achieved on some panels especially when running a reduced dynamic range (reduced contrast) to avoid the more problematic (slower) GtG pairs. As a result, the image above says “Nearly GtG-complete Refreshed Zone” (refreshed areas) above and below the blurry GtG zone (scanout area that wipes downwards). A Custom Resolution Utility is built into NVIDIA Control Panel (Custom Resolution) as well as AMD too. However, for creating Large Vertical Total (that properly 100% bypasses GPU scaling), we recommend the use of ToastyX Custom Resolution Utility. It is usually best to use ToastyX instead of the graphics vendor’s utility — as GPU scaling sometimes internally overrides the Vertical Total. A CRU gives you the equivalent of an airplane cockpit’s view of creating a custom computer resolution, and this is the mechanism that allows you to increase the size of the Vertical Total. To learn more about these settings, see GLOSSARY: Custom Resolution Utility Terms. CAUTION: Monitors may display strange stuff, go out-of-sync, or go black, if you use an excessively large Vertical Total. 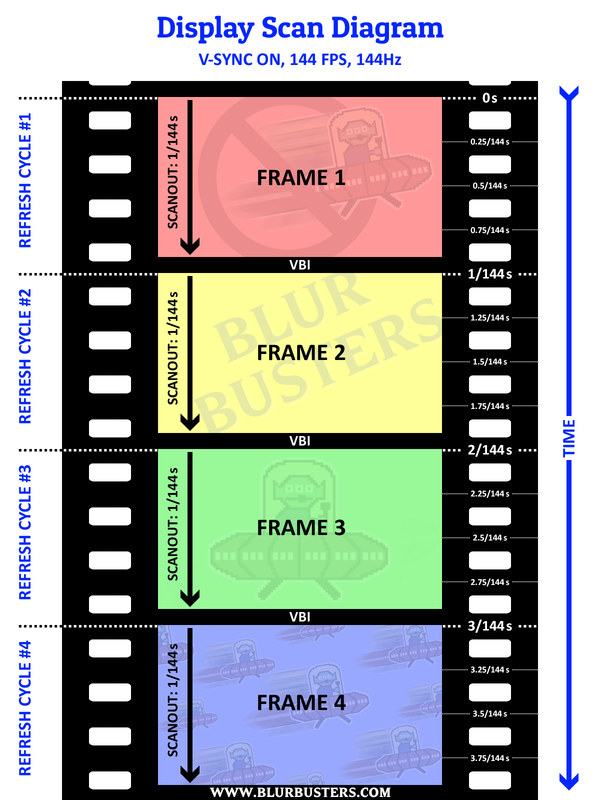 To save trouble, check the Blur Busters Forums community for recommended Vertical Total settings for a specific monitor. But wait! There’s a solution to fix that. You accelerate the scanout of the LCD (scan faster) and pause longer between refresh cycles. This gives more time for LCD GtG to finish between refresh cycles, before flashing the strobe backlight. …Now you’re getting it from a visual point of view: The height of “VBI” in the scanout digrams needs to be taller than the “GtG Zone”! This is how a monitor can hide strobe crosstalk between refresh cycles — timing the strobe backlight in a way to move the crosstalk band off the bottom edge of the screen long before it reappears at the top edge of the screen. The end result: Clear, CRT motion clarity LCD with faint or zero strobe-crosstalk double image effects. Note: We’ve been able to test a 240Hz LCD (1/240sec scanout) to strobe at 60Hz, with a near-zero strobe crosstalk — allowed by a 1/240sec scanout (4.2ms) and a 3/240sec VBI (12.5ms !!!). With that, 12.5ms is very massive blanking interval that can reliably hide the strobe crosstalk of a well-overdriven 2ms GtG TN LCD. Panels permitting massive vertical totals can allow you to nearly perfectly zero-out the strobe crosstalk. Also, we found that at least one 240Hz monitors supports frame-delivery at a VT1302 (equivalent to 1/280sec scanout of active scanlines), so 240Hz strobing is gradually becoming practical on some newer panels. So how do you do that? Yep! Large Vertical Totals. Many monitors automatically do that internally (e.g. ULMB and LightBoost) but you can manually accelerate the scanout on some monitors (e.g. most recent strobed BENQ gaming monitors) via a Custom Resolution Utility. To make it easier to understand Large Vertical Totals, let’s look at an old analog TV. If you have been around since the days of old analog TVs you may have seen a rolling picture of an old analog TV with a mis-adjusted VHOLD knob. The use of a Large Vertical total is tantamount to increasing the thickness of the black bar between refresh cycles. Essentially, to reduce strobe crosstalk, you are moving the LCD GtG zone into a “thicker” blanking interval. This is where you try to move the “LCD GtG Zone” to. You adjust strobe timing to make the LCD GtG Zone occur in a thicker blanking interval between refresh cycles. This allows you to hide LCD pixel response limitations between refresh cycles. In other words, VT1350 gives you an invisible 270-pixel-tall blanking interval before the strobe crosstalk zones wraps around between the top/bottom edge of the adjacent refresh cycle. If the strobe crosstalk zone is not taller than the blanking interval — then you’re able to completely hide the LCD GtG Zone (Strobe crosstalk zone) between refresh cycles! As a rule of thumb, the closer you hit the monitor’s maximum refresh rate, the worse the strobe crosstalk becomes. Large Vertical Totals are easier at lower refresh rates, since the monitor often requires Reduced Vertical Totals (Reduced Blanking) at their highest refresh rates (e.g. 144Hz or 240Hz). Reduced Blanking is extremely bad for strobe crosstalk, so it is recommended to choose a refresh rate lower than the monitor’s maximum refresh rate, for best-quality Blur Reduction operation. Hope this helps explains strobe crosstalk science/physics & why Large Vertical Totals help! Tip: Did you know FreeSync / VESA Adaptive-Sync (variable refresh rate) works by varying the size of the blanking interval between refresh cycles? This is equivalent to varying the height of that normally-offscreen “black bar” that separates refresh cycles. A variable-height blanking interval! The scan rate (pixel rows per second) is kept constant, and the dotclock (pixels per second) is also kept constant. Varying the refresh rate is accomplished by adding/removing hidden offscreen blank rows of pixels between refresh cycles. As a mathematical example of how Large Vertical Totals can accelerate scanout velocity on “Instant Mode” LCD Panels — the Zowie XL2720 monitor, for example, supports a Vertical Total of 1350 during 120Hz refresh cycle. 1350 equals 1080 + 270. Visible vertical resolution plus the whole vertical blanking interval (including sync/porches). Monitor will spend 1080/1350ths (visible vertical resolution) of a 120Hz refresh cycle scanning-out onto panel. 6.6ms is 1/150th of a second. VT1350 for 1080p 120Hz forces the monitor to scan-out a 120Hz refresh cycle faster in just ~1/150th of a second. The accelerated scan-out followed by longer pause between scanouts, is what allows the 1ms TN LCD GtG to (mostly) finish in dark between strobes/between refresh cycles. This helps you put the “LCD GtG Zone” more cleanly between refresh cycles. This means you’ve precisely adjusted the Vertical Total and strobe timing to have the backlight turned off during LCD scanout and LCD GtG response. The strobe backlight is flashed only on a more fully refreshed LCD panel before the next refresh cycle. Avoiding the strobe crosstalk of flashing during incomplete LCD GtG transitions. The screen flickers 120 times a second, like a 120Hz CRT, with none of the normal LCD motion blur. The Large Vertical Total, thusly reduces the amount of strobe crosstalk, by making it much easier to calibrate strobe phase — you can push the horizontal band of double-image-effect off the bottom edge of the screen before it really wraps around back to the top edge of the screen. 10. Not all monitors support large Vertical Totals. Please note this trick doesn’t work on all monitors. It requires the monitor scaler to support real time scanout (instant mode) from the video signal. Not all monitor scalers do. Known supported monitor brands includes some BENQ and Zowie gaming monitors with Blur Reduction, including Dynamic Acceleration (DyAc), XL2720Z(version 2+), XL2420Z, XL2411Z, XL2420G, XL2735, XL2540, and XL2546. Other manufacturers may also work. For LightBoost/ULMB monitors — for ease of use, they are already pre-adjusted with a fixed scanout velocity. NVIDIA already automates faster scanout (an internal equivalent of Large Vertical Totals) in ULMB and LightBoost. They (partially) buffer a refresh cycle and then output an accelerated scan-out to create the longer pauses between refresh cycles. This makes it easier for users, no CRU tweaking needed. Users can just turn ON/OFF the ULMB setting. 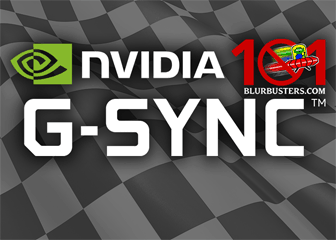 NVIDIA licenses these technologies to monitor manufacturers as part of GSYNC Monitors. They are very easy and wonderful technologies with easy one-button enable, often with better strobe-optimized overdrive. That said, it is possible for monitor manufacturers to provide user adjustments, to allow users to do calibration towards reduced strobe crosstalk. Different monitor models — or different refresh rates on same monitor model — will usually require a different (bigger, smaller) Vertical Total. New monitor models that include an adjustable strobe backlight feature may or may not improve with Large Vertical Totals. It is more likely to work if they support real-time scanout (Instant Mode / Lag Free) from the signal while their strobe backlight mode is enabled. Panels that support FreeSync / VESA Adaptive-Sync are more likely to have fully flexible Vertical Total support even for fixed (non-variable) refresh rates. As a rule of thumb, the lower the refresh rate, the bigger the Vertical Total can become. Untested: Different monitors models (e.g. LG 24GM77 and their MOTION240) may or may not work with this. 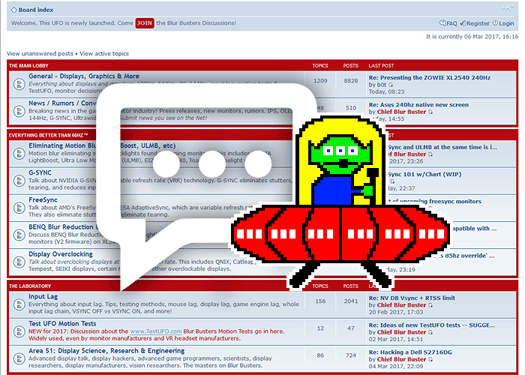 If you find interesting new findings on new models, please post your results in Blur Busters Forums! Names includes “Instant Mode”, “Lag Free”, “Real Time”. The monitor needs to scan-out to LCD panel synchronously with signal, in order for Large Vertical Totals to be useful for strobe crosstalk reduction. Generally, the lower the refresh rate, the less strobe crosstalk there will be. Assuming the strobe phase is adjustable via the monitor menus (or correctly pre-adjusted). – Select the timings of the working high-Hz mode (e.g. 240Hz) with the working maximum dotclock. – Lock the dotclock (put radio button on Dotclock). Make sure dotclock DOES NOT change. – Stop increasing vertical total once the (vertical) refresh rate reaches near the desired number. Note: You may only be able to achieve have strange VTs (e.g. VT2136 or VT1844) and strange fractional refresh rates (e.g. 124.999Hz or 144.001Hz). You’re maintaining the dotclock — and the scanout velocity — of a fully supported mode. This decreases the likelihood of “out-of-sync” issues, where the screen goes black upon a larger vertical total. Look for strobe crosstalk again. View the TestUFO Strobe Crosstalk motion test and look at the strobe crosstalk (double-image artifacts). Adjust the “Strobe Phase” or “Area” setting if the monitor has a setting. Try keeping Vertical Total the same, but swap the Back Porch and Front Porch numbers. Test a motion test again, to see if the strobe crosstalk zone has shifted upwards/downwards (closer to being pushed off the top/bottom edge of screen). Try using a small “Sync” number, but use a larger value in either the Vertical “Front Porch” or Vertical “Back Porch”. Usually, the easiest way for monitor manufacturers to add Blur Reduction to monitors is to license NVIDIA’s ULMB, which is a simple ON/OFF toggle with no need for strobe phase calibration. Strobe backlight engineering is very complex including complex overdrive algorithms for excellent results. However, for monitor manufacturers, there are now simpler engineering options that can provide adequately good results with blur reduction on stock panels with stock overdrive, with minimal extra engineering. Thanks to FreeSync / VESA Adaptive-Sync / HDMI 2.1 VRR, generic LCD panels are getting very flexible with accepting Large Vertical Totals even for fixed (non-VRR) refresh rates. This is because these variable refresh rate technologies use a variable-sized blanking interval as their technique. In addition, they are also getting more flexible with realtime scanouts (from signal), where the panel scans synchronously from the video signal. There are panel quirks and exceptions, but it is getting much easier to accelerate LCD scan-out on these panels, even via external means (including by the end-user, via Large Vertical Totals in Custom Resolution Utility software). While high-quality engineering is preferred, it is now possible for monitor manufacturers to avoid a lot of strobe backlight engineering complexity (e.g. offload accelerated scanout to GPU via Large Vertical Totals instead). This means more panels now support massive Vertical Totals. Many panels and scalers also include overdrive sufficiently adequate for strobe backlights (even if not as good as NVIDIA’s ULMB). This is sometimes even unbeknownst to many monitor manufacturers who simply order a pre-manufactured LCD panel with a built-in scaler and built-in backlight, to be installed into their branded monitor bezel/enclosure. Generally, a 144Hz+ TN FreeSync panel will usually have reasonable Blur Reduction behaviours with a light amount of further engineering, to add a few simple manual end-user adjustments. These panels generally easily support Large Vertical Totals (for reasonably high-quality strobing) on TN panels at 120Hz and less. For IPS panels, a larger margin between maximum refresh rate & strobed refresh rate is usually needed. VRR technologies uses variable-sized blanking intervals (variable Vertical Totals) to achieve their variable refresh rate. As a side-effect, these panels often work with user-created Large Vertical Totals to help eliminate strobe crosstalk in non-VRR mode (at slightly lower fixed refresh rates). 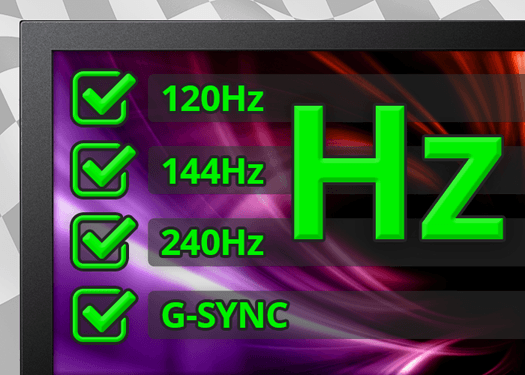 As a rule of thumb, a 144Hz FreeSync panel can support high-quality 100Hz-120Hz strobe backlight via end-user strobe calibration. Adjustable timing of backlight flash relative to beginning of refresh cycle. Make it adjustable through the whole range of refresh cycle. Adjustable length of backlight flash. Longer can be brighter but blurrier/more strobe crosstalk. Shorter can be darker but sharper motion/less strobe crosstalk. Ideally, allow strobe pulse widths as small as 0.25ms (or less) all the way through 1-2ms (or higher). Warning: Excessively long pulse widths will not be able to cleanly fit in the interval between refresh cycles. Pulse width needs to be adjustable all the way down to 1ms and less. Many monitor manufacturers do not provide a single-strobe 60Hz mode (instead, double-strobing 60Hz, or not even providing Blur Reduction for 60Hz at all). This is quite unfortunate. While 60Hz flicker is annoying to many users, we also have users who get motion blur sickness/headaches — to the point where flicker is preferable among some of them. “Flicker Free”, “Eye Care” and “PWM-Free” is wonderful — and helps many of us — but we need a 60Hz single-strobe option for users. Several users would like to use proper Blur Reduction (no double-image effect) for 60Hz emulators and 60Hz console gaming. These should be monitor menu settings, or even “Service Menu” settings. Ideally, these adjustments should be also accessible via DDC/CI to permit the user of third party utilities to ease adjustment (e.g. Blur Busters Strobe Utility). DDC/CI is already being done to allow generic calibration of color, but it can also be used for generic calibration of blur reduction strobe backlights too. Users can easily adjust strobe length and phase via motion tests such as TestUFO Strobe Crosstalk. They simply look for a “band” of double-image artifacts. Adjusting strobe phase simply moves this band upwards and downwards.